Since we all need to make a little money, we offer promotions through third parties. Consider this my version of "Buy me a Coffee" Read on for full details. To help the website expand, cover costs of running the site and for me to be able to continue my side street adventures, some advertising and affiliate links are run on Side Street Travel Tips. Affiliate links earn me a (very) small commission on any purchases made when visiting Amazon or ShareASale after clicking on one of these links. I will do my absolute best to only provide you with information about (travel) products and useful items that I truly believe in. I will never take your trust for granted. All reviews on my website will be presented honestly and I will disclose whether I will be receiving any commissions or products for free. This website is a commercial site written and edited by our team. This site accepts forms of cash advertising, sponsorship, paid insertions or other forms of compensation. This is how we provide you wonderful content. The compensation received may influence the advertising content, topics or posts made on this site. That content, advertising space or post may not always be identified as paid or sponsored content. You should assume all links and banners are ads. The owner(s) of this site is compensated to provide opinion on products, services, websites and various other topics. Even though the owner(s) of this blog/website receives compensation for our posts and content or advertisements, we always give our honest opinions, findings, beliefs, or experiences on those topics or products. The views and opinions expressed on this site are purely the webmasters’ own. Any product claim, statistic, quote or other representation about a product or service should be verified with the manufacturer, provider or party in question. This website may contain content which might present a conflict of interest. This content may not always be identified although we will do our best to mention it in the content. We do aim to please so let us know if you think any of our affiliate advertisements are not appropriate. 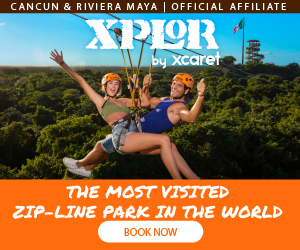 Book Xenses Park A new experience to awaken your senses, more than 15 activities at Cancun & Riviera Maya. Save 15% online presale. Book Xoximilco Park is a real Mexican fiesta at night! Soiree on floating barges with live music, tequila, beer and fun. Save 15% online presale.